DETROIT — Sometimes Minimalist artworks fit so perfectly into a market for objects featured in Dwell magazine spreads that one has to wonder if there is actually anything going on below their surface. But in the case of a new body of work by Brazilian artist Simone DeSousa, there is. In April, DeSousa made a rare presentation of her work, collectively titled Calculating with Absence, currently on display at Holding House. This collection of austere canvases powerfully distills her very unique perspective: a fearless examination of human consciousness through meditation, by way of the Modernist aesthetics of her native Brasília. DeSousa originally trained as an architect at University of Brasília, in a city she describes as characterized by its hyper-designed elements. Since much of Brazil’s indigenous population sprang up naturally in relation to its Atlantic coastline, the decision to found the federal capital city in the sparsely populated center of the country meant that the whole urban center was constructed in a relatively tight period of time. Funded by the unpaid labor of “rubber soldiers” who harvested Amazonian rubber for lucrative trade with the United States (for use in production of WWII equipment), the city is uniformly governed by the prevailing modular and modernist doctrine of the late 1950s. Raised in this context and steeped in its architectural tradition, DeSousa’s choice to work with a modernist vocabulary is a highly personal and culturally relevant choice rather than a mere exercise in popular aesthetics. Likewise, the vibrant contrast she achieves by disrupting her mostly black, white, and gray canvases with intermittent fields of dense color (cherry red, goldenrod, aquamarine, light sienna) are a tribute to her homeland’s clean, minimalist spaces punctuated with bursts of life. DeSousa likens the overall effect of Brasília as a kind of spaceship set down in the jungle, self-contained, ultra-designed, and in high contrast to its natural setting. With this background governing her formal choices, DeSousa is free to focus on content, and here is where her focused explorations take a profoundly contemplative turn. DeSousa is 10 years deep in a rigorous meditation practice, one that she considers to be a search for truth — which seems to be her guiding principle not only as an artist, but as a human being. A journey of this kind contains a kind of paradox: in attempting to access the universal, one must either reach infinitely outward, like Einstein, trying to bring order to all that can be contemplated, or else attempt the same process by turning deeply within. 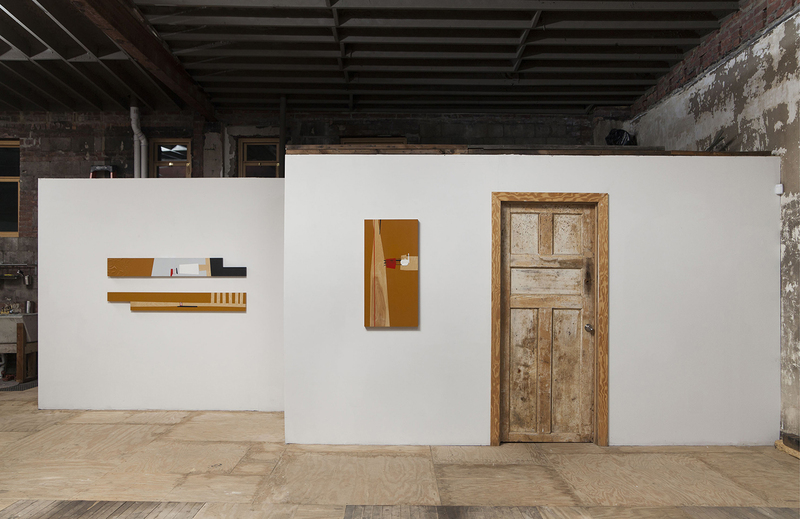 DeSousa has chosen the latter method, and the works she has produced for Calculating with Absence are attempts to share the interior dimensions she has uncovered. 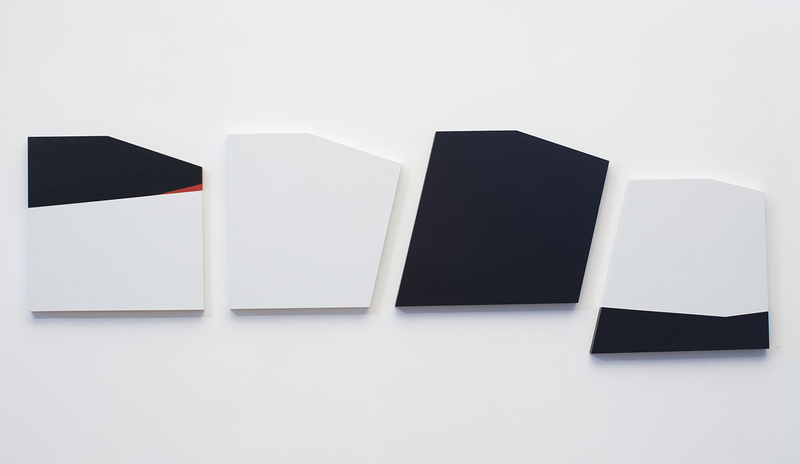 The works are hung in relation to each other; sometimes individual works stand alone or in series, but more often a collection of pieces amount to a single idea. Often, DeSousa will introduce a base concept — titled after principles within Buddhism, such as “Base, Path, and Fruit,” “The Jewel in the Lake,” or “The Secret Path” — and then break it down into a sub-series. 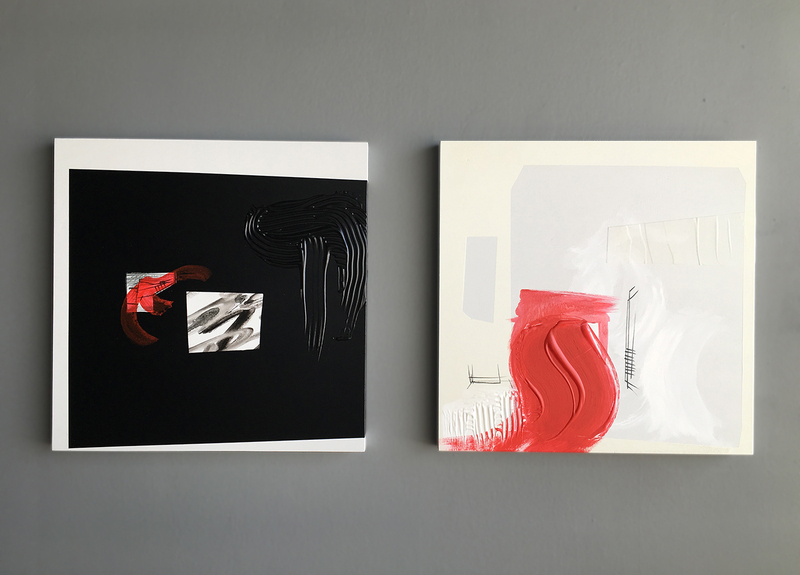 These series are arranged on walls dividing the usually wide-open, high-ceilinged main floor of Holding House into more intimate spaces, and force a consideration of not only each canvas, but its relation to the others in its cluster, and crucially, the space between and around them. The arrangements are clearly very literal and significant to DeSousa, though she remains ultimately detached regarding the viewer experience. 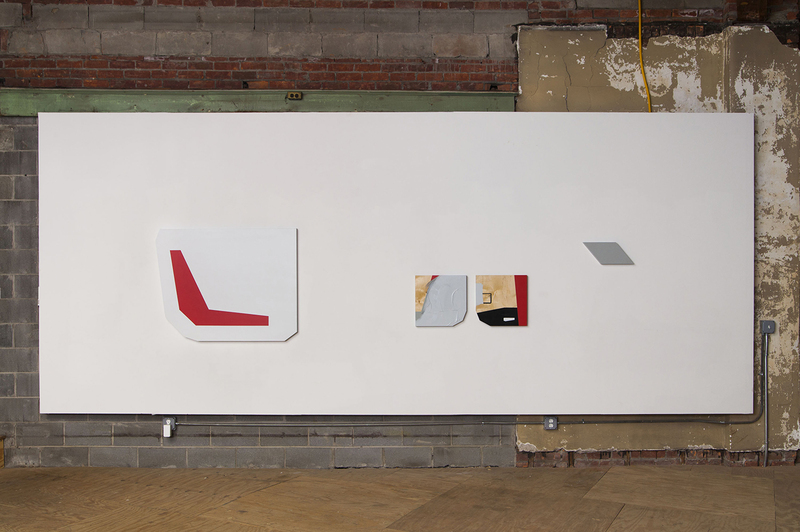 When we met in her expansive studio space within the Russell Industrial Center, DeSousa took a break in musing on the arrangement of her canvases to lay out some of her source material, which included the philosophical text, “Incomplete Nature: How Mind Emerged from Matter” by Terrence W. Deacon, and the comprehensive examination of the Neo-Concretism movement, “Neoconcretismo: Vértice e Ruptura do Projeto Construtivo Brasileiro” by Ronaldo Brito (Cosac Naify, 1999), and “The Dalai Lama’s Secret Temple,” which depicts never-before-seen murals on the walls of an isolated temple that was reserved for the exclusive use of Dalai Lamas throughout the ages. The concept of this secret temple is fascinating and moving to DeSousa (one of the sub-series is titled “The Temple of Bliss and Emptiness”) in her consideration of what is transcendental and what is intimately human. The graphic murals, which resemble Kama Sutra-like, flat-perspective illustrations of practices including the relationship between spiritual forces and procreative acts, are not, perhaps, what one expects to see in connection with a holy place of spiritual contemplation, just as DeSousa’s spare and restrained paintings do not immediately intuit philosophical, locational, and spiritual connections. But viewers who are willing to sit in quiet contemplation of the inner nature of the work — and of themselves — will discover something fluid and personal beneath the seemingly rigid canvases. Simone DeSousa’s Calculating with Absence continues at Holding House (3546 Michigan Ave, Detroit, Mich.) through June 10.